« Wine – My Fall Favorites! It’s Thanksgiving weekend here in Canada, and it’s a time to enjoy family and friends and give thanks. I have been very blessed in this lifetime with a great family and fantastic friends, and I love to enjoy the times with good food and wine. Many of us will be serving turkey this weekend, and the age-old question for turkey dinners is ‘Which wines go best with turkey’? I have a couple of favorites that I would like to share. How about trying a wine you’ve probably never heard of before? One of my favorites is the crisp refreshing Viognier. Vee-what? Pronounced Vee-Oh-Nay, this crisp white wine is a perfect complement to turkey. The one pictured is probably my favorite, Stags Leap Viognier, one of the more pricier ones, but you can get Viognier starting at about $15.99. Elegant, crisp with perfect acidity. Other great options for a white wine to go with turkey are Riesling, Pinot Grigio and my other favorite Sauvignon Blanc. Sauvignon Blanc and Pinot Grigio are both crisp, well-balanced and again, has that perfect combination of acidity that will go well with the turkey, stuffing and potatoes. Riesling is a little sweeter, but pairs with some of the saltier foods that may be served this weekend. Some perfect examples are pictured below. But Darlene, I only drink red wine. No worries… we have a red for that. Like Pinot Grigio, its red cousin, Pinot Noir, can also go with turkey. Generally, Pinot Noir is light to medium bodied, so it doesn’t over-power the turkey. And it’s peppery flavors can really compliment the gravy. Pinot Noir also has bright acidity to compliment the turkey and soft tannins which pairs well with green vegetables. A couple of my favorites. Chateau St. Jean is a beautiful Pinot for under $20 and the Pierre Andrew Volnay is a French Burgundy wine, which is Pinot Noir. It’s a little more pricey, at about $45, but a beautiful soft wine with lots of flavor. 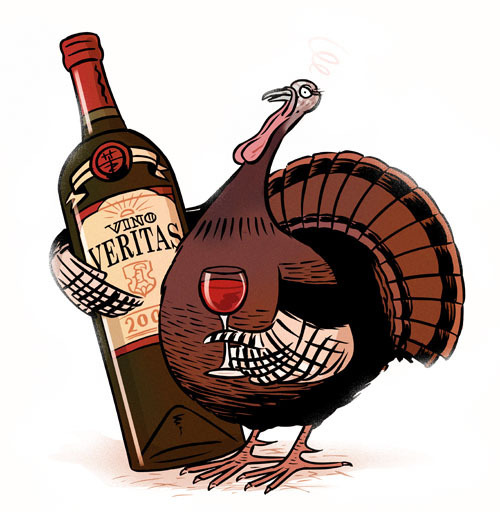 These wines go well whether you are serving turkey or ham. If you can’t find either of these, head to the New Zealand section of your Liquor Store or Wine store. New Zealand makes beautiful Pinot Noir, as well as some of the best Sauvignon Blanc I have ever tasted. Other reds to consider for Thanksgiving dinner is a Beaujolais, young and fruity, you need to drink it quite cool to preserve the flavors. The one below is one I have recently tried from Louis Jadot. Believe it or not, sparkling reds or whites will also pair well with turkey. But Darlene, I’m not serving turkey, I’m serving ham. Another delicious Thanksgiving meal. Maybe you’re like me and serving both. Pinot Noir’s go great with pork, as does a beautiful California Zinfandel. Check out this one from St. Francis, but be careful, it has 15.7% alcohol. And although the alcohol doesn’t over-power the taste the wine, you will feel it once you get near the end of the bottle. And if you think that may be a little much, the next one is Gnarly Head Old Vine Zinfandel, a beauty of a wine for under $20. This entry was posted on October 12, 2013 at 2:34 pm and is filed under Wine & Food. You can follow any responses to this entry through the RSS 2.0 feed. You can leave a response, or trackback from your own site.